Or you can swap out a small space of uppers. But because of my lack of KEEPING things organized and tidy( I can organize with the best of them, keeping it that way…um,kind of a challenge! 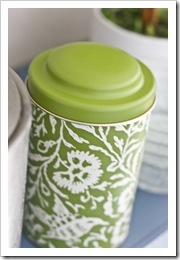 ), switching out a small space of uppers seemed like the perfect solution for my kitchen. 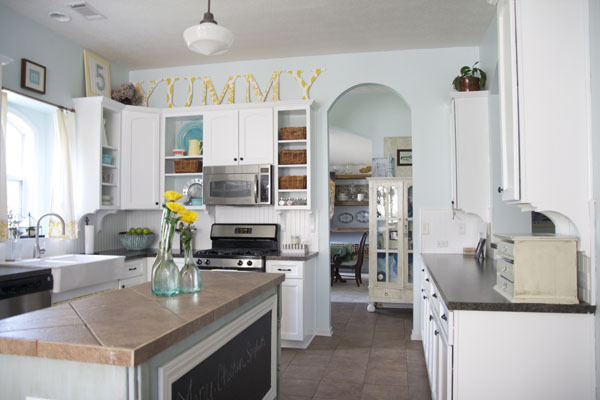 The first thing you want to do is take down your upper cabinets. Mine was a single cabinet to the right of my kitchen sink. So it was actually quite easy to remove. I did it by myself in about 10 minutes. But depending on your space you may need some help. So plan accordingly. We don’t want any accidents! 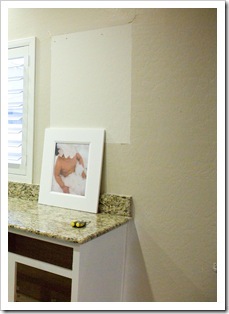 After removing your cabinet, it’s important to patch up any holes or imperfections with calk or any filler for drywall. I didn’t ,but you should…lol! After it’s dry, paint over the patches and the part where the cabinet once hung. 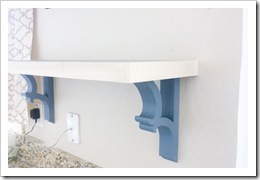 how thick or thin do you want your shelving? 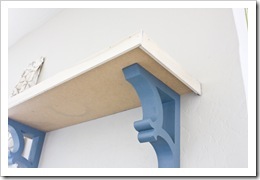 how long or short you want your brackets or corbel? and how much space would you like in between each shelf? 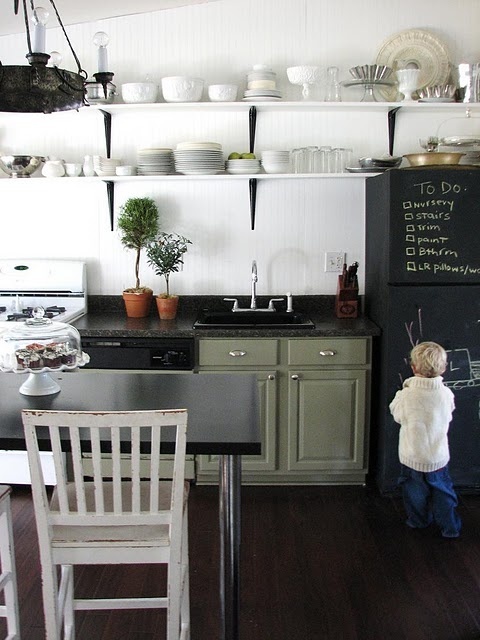 do you want them to blend in the the cabinetry? 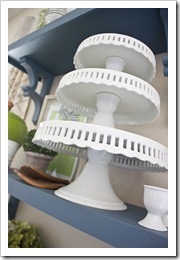 would you like them painted,rustic,glossy? What finish will look best? do you have studs to work with or are you going to need extra support? 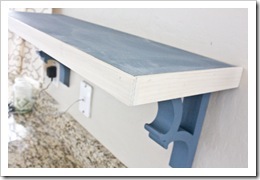 Once you’ve decided on the look start preparing your corbels or brackets to be hung. 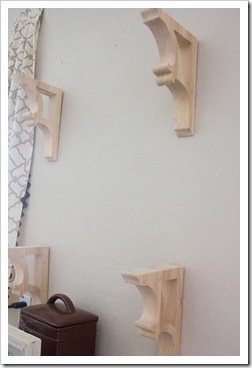 My corbels came with a keyhole so it was pretty simple to hang. 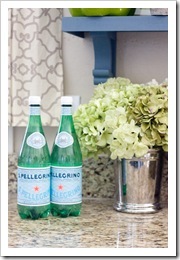 Whether your comes with a keyhole or a traditional hole you can use these tips that I found. 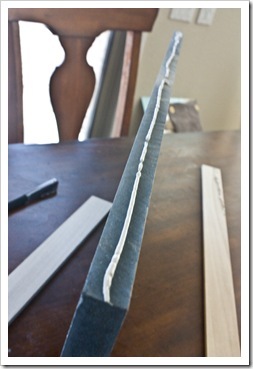 For the shelf part your going to need a thick piece of plywood cut to your desired length. (I think mine was about 1/2in thick) I picked up some super cheap scraps at my loca1 ReStore. They cost me about 1.50 each shelf. My shelves are 33×12. Just enough room to hold a full size plate and cake plate. 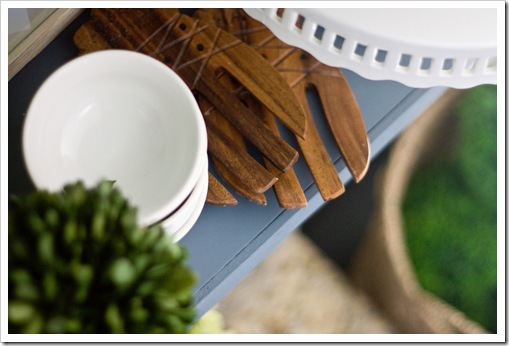 *Optional: 2in poplar/hobby wood cut to length for the edges of the shelf. You can pick these up at HomeDepot. 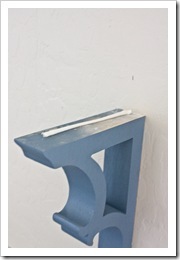 This piece will give your shelves a slightly thicker look that I added on later. Lightly sand all your material as needed. 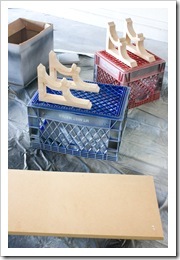 Then paint them the desired color. 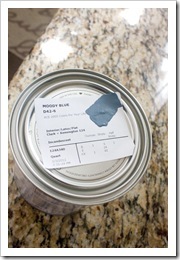 I choose this moody blue by SW that I got color matched with my FREE paint from Clark+Kensington paint at ACE I got last weekend. It’s a primer and paint in one so I didn’t need to worry about an extra step. You can use a paint brush or a sprayer like I did. Those things were painted in no time flat. I love my sprayer!!!!! I’ll talk about that more in my cabinet post. 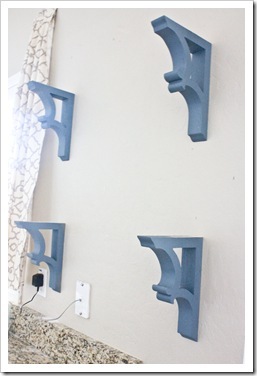 After they dried I hung my corbels up and gave the shelves a test run. I liked them a lot! BUT I wanted them to be slightly thicker or chunkier:0) So instead of starting over I just add a piece of 2 in hobby pieces of wood to the front and sides with 2 inch nails and liquid nails. Then I took the shelves down and gave it another coat of paint on the sides and on the bottom. After they dried for a few hours I hung them up! 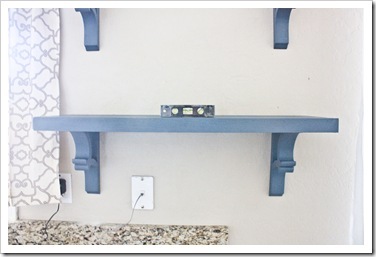 I attached the shelves with liquid nail and allowed it to dry over night. 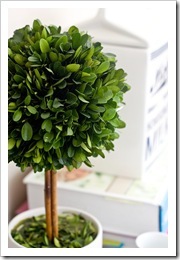 ( With all types of décor on it of course…lol) I’m so impatient sometimes! Chrome Flower Pot: .99 from Target about a year ago. Looks awesome! Love that shade of blue. 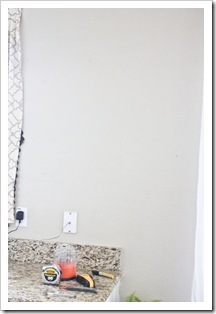 You know you’re a blogger when…You stand on your countertops to take a picture of your purdy new shelves from a great angle. 🙂 I love how they turned out! Maybe, just maybe, I might get up enough courage to try this at my house! Those are darling. They look like they are styled for a magazine shoot! Just stunning. 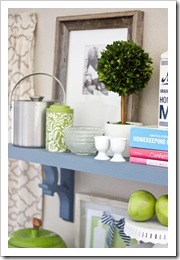 Love love love the pop of color on the shelves. So much fun and don’t worry, I am also scared of open shelving because yowza… probably not so pretty after we live with it for awhile! 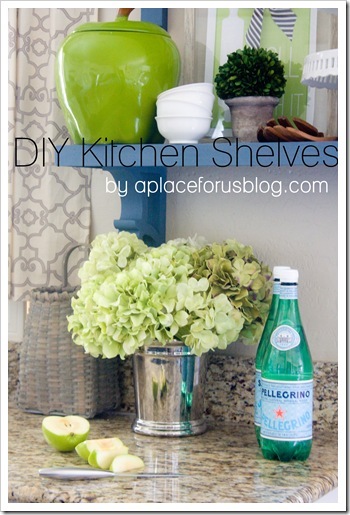 I LOVE open shelving! When we buy our first house, I definitely want to add some! I am completely in love with your shelves. You did such a wonderful job. Way to go!!! I can’t wait to see the entire kitchen finished! So cute, and I love the paint color. I think I might switch out the impractical towel rack in our master bedroom and try this out. Definitely pinning the tutorial for future reference. Can you share which eBay seller you used? PLEASE PLEASE share the bay seller – these would be PERFECT for my kitchen. 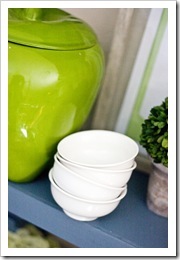 I just came across your shelves on Home Stories A to Z and love the pops of colour! 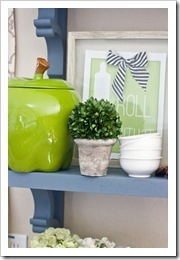 I just finished up styling my kitchen shelving with a combo of green and lighter shades of blue. 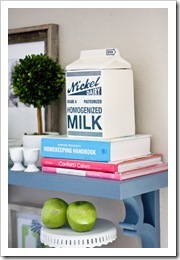 Your milk carton cookie jar is adorable! 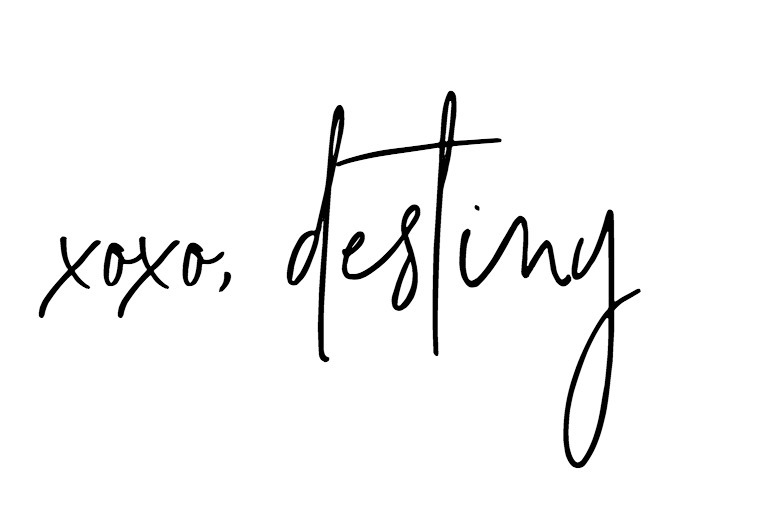 super cute – and I love the syling. nice to find you from Beth’s place! I just love how these look. I’m so inspired! Those are gorgeous! 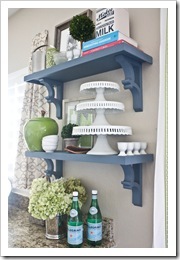 I absolutely LOVE the color of the shelves and you have decorated them perfectly. The Ebay seller is Alabama Hardware! Fabulous job with awesome idea! Doing my kitchen in the future looking for new trends.